This expedition is not currently scheduled, though we have run it in previous years and can do so again on request. 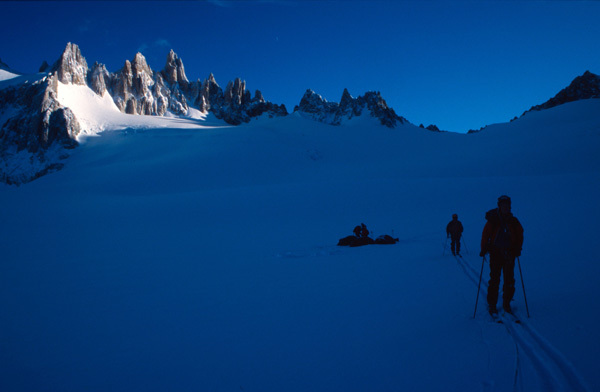 This ski mountaineering expedition is an exciting journey to some remote areas of Northern Patagonia. 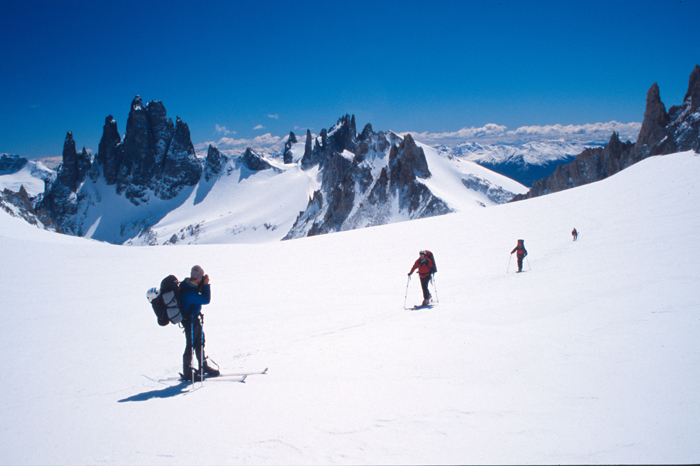 The main objective is to ski and climb San Lorenzo 3706m, the second highest peak in Patagonia. This is a challenging itinerary that will take you into some very remote terrain at the other end of the world. We will certainly be escaping from the crowds. After flying to Coihaique in southern Chile we'll spend a couple of days doing day tours in the immediate area to warm up, and to get used to the conditions. We will also get a day in at one of the worlds most southerly ski pistes at El Fraile. We'll then drive south towards Cochrane stopping at the Portezuelo Ibañez, where we'll ski peaks of around 2000-2500m height. We'll be based in a campsite in beautiful pine forests while here, last time around this was a highly enjoyable part of the trip, with mornings spent on long ski trips, afternoons spent sunbathing, and evening barbeques around a camp fire. We then begin the expedition in earnest by approaching San Lorenzo from the small village of Cochrane. In summer it's just a 3-4 hour walk to the hut beneath the mountain from the end of the road. The area is a beautiful, forested, pastoral landscape, backed by rugged mountains. It's also famous for being a good place to see pumas. The ascent of San Lorenzo from the hut is a relatively complex route over 2-3 days with a high camp at about 2700m. However it is not too difficult technically, with the hardest section being an ice-fall at about PD/AD. Other peaks in the area will be climbed and skiied if time and weather permit. After about eight days in this remote area we'll return to Cochrane and then Coyhaique for some well earned steaks and wine! This expedition will fly out to Santiago and depending on flight schedules we may have a part day in the city at the beginning or end of the expedition. Santiago, the capital of Chile, is a large city but is one of the most pleasant and relaxing cities in South America. Coihaique is a major town and communication centre in central Chilean Patagonia. We will fly here from Santiago. It is a very pleasant wee town of wooden built houses and tree lined streets that is just starting to be discovered by tourists from Chile and Argentina. Our first few days will be based here in hotel accomodation. Cerro San Lorenzo from the north. 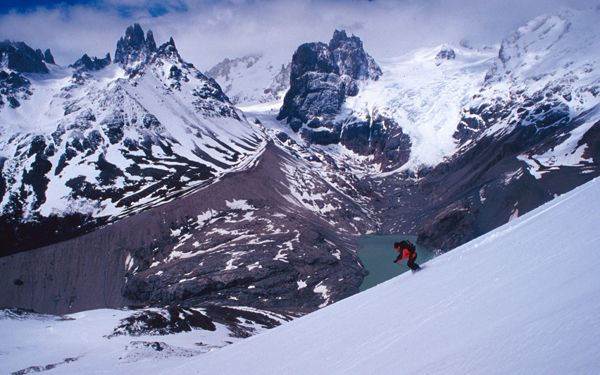 This peak, pictured above, lies on the Chile-Argentine border in a remote part of Patagonia. It was first climbed in 1943, but is still not often climbed. We first visited this peak in December 2003 and were impressed by how beautiful the area was. Our trip to San Lorenzo starts with a 2-3 hour drive from the village of Cochrane, then a walk (or ski if there's snow) in to the farm at Fundo San Lorenzo taking 2 hours. From here another 2-3 hours gets us to a small hut with wood-burning stove at the bottom of the peak. Depending on where the snowline is we may use horses for all of this approach, or we may ski with sledges, or we may have to backpack. The ascent of San Lorenzo from the hut is a relatively complex route over several days, crossing two cols on the way. Summit day from a high camp at about 2700m is usually the most technical part of the climb, with the hardest section being an ice-fall at about PD/AD. As we travel south from Coihaique to Cochrane the intention is to stop in various places and ski peaks, making the best use we can of the prevailing weather. The best of these areas, which we used last time, are the un-named peaks around the pass of Portzuelo Ibañez. 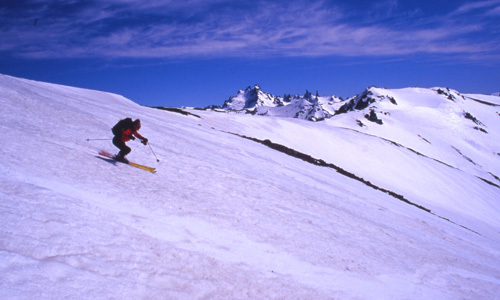 Here there are a number of great ski tours to peaks as high as 1998m. Some of the lower peaks of up to about 2200m near the impressive Cerro Castillo (2675m) are another option for this phase of the itinerary. Setting off from camp, summit day on San Lorenzo. If you want a trip with endless hot sunny days we're afraid northern Patagonia in spring is not the best place to go! However it does get its fair share of good weather between periods of rain or snow and strong winds. Rainfall and temperatures in the valleys around Coihaique are basically similar to those in northern Europe during early spring. Out in the mountains at up to 2500m altitude it can be hot during the day in the sun, or it can be cold, cloudy and windy. High up on San Lorenzo it will be cold and frosty at night. We are likely to get some strong winds and fresh snow from time to time and we will probably have at least one day stormbound in tents or huts at some point. Expedition members should be fit and competent nordic or alpine skiers preferably with previous touring experience. The minimum skiing ability necessary is being able to descend black runs confidently and at a reasonable speed. Winter skills including use of an ice-axe and crampons will be needed for the ascents and it is essential to have these skills to at least a basic level before joining the expedition. Previous experience of winter, wilderness or glacier camping will be a major advantage in coping with the tough living conditions we may experience, but is not essential. This is a tough expedition for those with good mental and physical stamina. Good fitness is required to make the most of this expedition and some recent experience of backpacking is essential. You must be able to carry your own rucksack (up to 20kg) when necessary. In Patagonia, even in the spring, it can be cold and we will definitely have a few stormy days. Expedition members must be prepared to work as a team when it comes to pitching tents, help with cooking and carrying communal equipment. Skiing above Puerto Ibañez, Chilean Patagonia. Our expeditions are designed to be small and flexible. The expedition will be co-ordinated, organised and lead by us, but we will consult and involve the expedition members when planning the details of the trip. Please note however that the leaders decision is final where the safety of the group or any member is in jeopardy; for example where retreat or diversion is necessary due to illness or bad weather. The minimum number of customers we need to run this expedition is three. The maximum size will be four customers plus leader. In some circumstances we may be able to run the expedition with just two members and a local leader. Driving, hotels and general safety : In Chile driving, fire safety standards and general safety standards are not as high as in Europe. Remoteness : You will be several days from medical help for periods of time. Weather might make medical evacuation impossible. There is no chance of a helicopter rescue. Weather : The Patagonian mountains are frequently affected by very stormy weather making travel and navigation difficult and threatening the safety of camps. Forecasts are not reliable. Mountain Hazards : There is a significant risk of avalanche and crevasse falls on San Lorenzo and avalanches on other peaks. In certain places you may be subjected to a slight risk of rockfall.